Makes great goodie bags, so that an exhibition of eco bags carries your eco art… your message. Teach a new generation of students how their personal actions can make a big difference in reducing the carbon footprint. Bags for students’ orientation events or selling the bag at a profit for fundraising will earn revenue for your establishment and your cause. 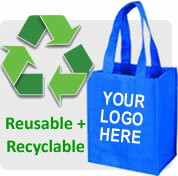 Go Eco savvy to boost brand awareness with eco bags. Use eco bags in place of paper bags or plastic bags to show your sustainable credentials. The more high end your retail shop, the bigger the impact. Give away or sell the eco bag to earn additional revenues for your shop. Design an eco bag for a cause to donate for charity. Consumers generally will buy a bag when they know it’s to help a cause. And they walk away carrying their buys in a trendy, savvy bag! Create a bag that has name tags and your organisation’s name and logo. The eco way to allow club members to carry your bag around and be marketers for your association. Design an Eco bag to replace single use packaging. It shows your organisation’s social commitment to minimise the impact of global warming. Market your bag and strengthen your brand image. Not only it helps to create your product awareness, it also enhance a company's reputation and credibility.